Have you met a Medlar? The Medlar is known less politely as the ‘dog’s bottom fruit’ (and other related and even less polite descriptive names, discovery of which is left as an exercise for the reader! ), and was once very popular, these days it seems to have been more or less forgotten, at least as a culinary fruit. 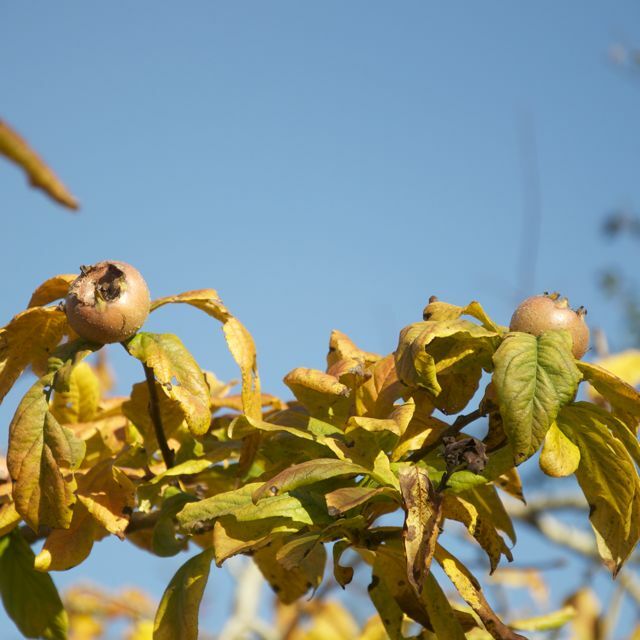 The Royal Horticultural Society describes Medlars by reference to their flowers and habit before their fruit. They’re in the same horticultural family as roses, filed somewhere between pears and hawthorn. I was lucky enough to be able to harvest a lovely little medlar tree, which yielded about a third of a carrier-bag full of fruit. While late October / early November is the right time to pick medlars, they aren’t actually ripe and need to go through a process of ‘bletting’, where they are allowed to ripen fully in a frost-free, cool dark place. The only place I have for a tray of fruit is the spare room, which while dark-ish and undoubtedly frost-free, is at house temperature. Bletting is supposed to take 2 – 3 weeks, during which the fruit will soften and become a dark brown to black colour. 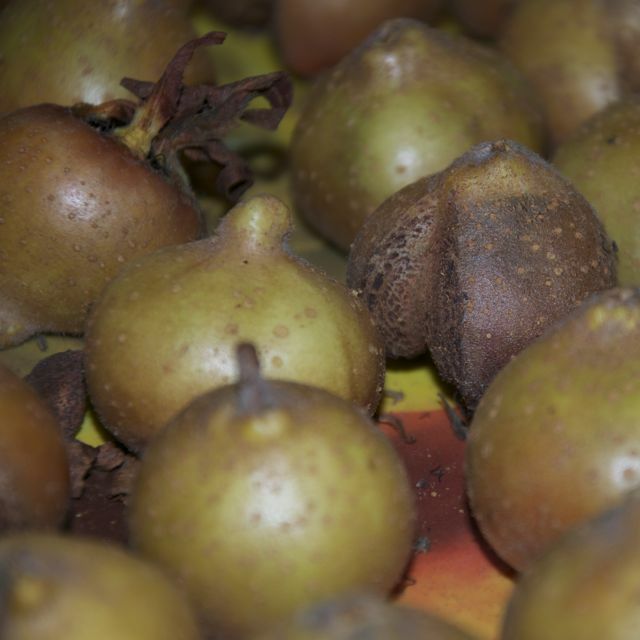 If it all goes well, I plan to make some medlar jelly, so I’ll be back in due course to let you know! This was my first experiment with adding aromatics to a bacon cure. I’d picked up a pack of ‘thick streaky pork slices’ from the supermarket bargain-meats section – a pack of five pork belly slices about as thick as they were deep, and seven or eight inches long. For the curing technique, see Bringing Home The Bacon. I probably wouldn’t recommend using this as a cure for bacon you intend to slice and have for breakfast (though, if you like it, why not? 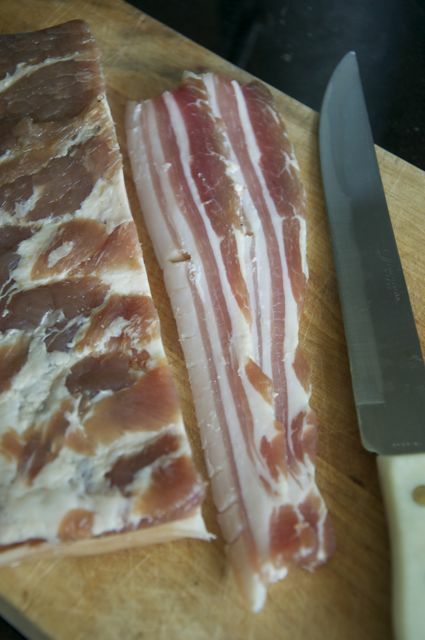 ), but it produces really excellent bacon for cutting into cubes and using in cooking. My first batch was incorporated variously into a celeriac and sausage casserole, a lovely rich bolognese sauce, cauliflower cheese, and sliced and fried to crispy as a burger garnish. 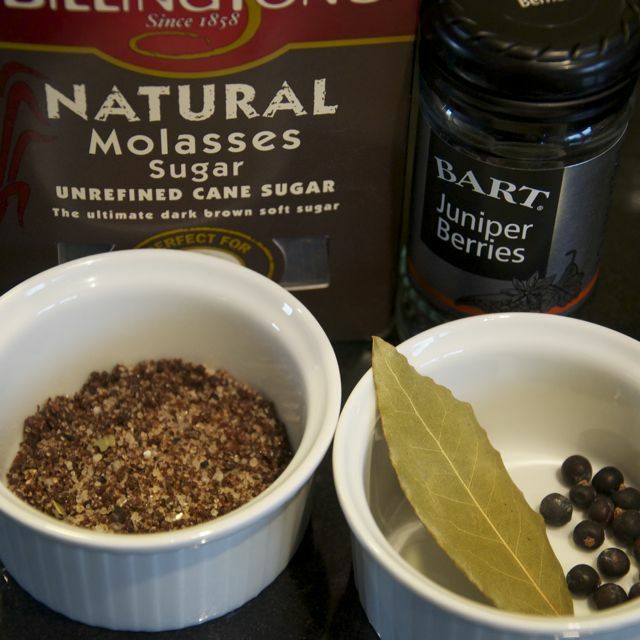 Put the bay leaf and juniper berries in a spice grinder or pestle and mortar and grind to a medium texture. Add the sugar and Supracure to the grinder and mix well. Store in an airtight container. Thanks to the juniper berries, the cure will smell faintly of gin. This is no bad thing in my opinion! This is quite a dark coloured cure with a distinctive aroma – it adds a lovely and unusual flavour to dishes when used in cooking. It seemed to go down well with the people to whom I experimentally fed it, anyway! Christmas is coming, the gin is getting pink! Sloe gin is a traditional country Christmastime treat, and is a liqueur made by flavouring gin with sloes (the fruit of the blackthorn bush) and sugar. The traditional time to pick sloes is just after the first frost (so right now, for most of the UK!) as this both damages the cell walls of the sloes and changes their flavour, sweetening them. You can make sloe gin very successfully with sloes picked before the first frost, but it’s wise to freeze them at least overnight before proceeding. BE AWARE – Blackthorn isn’t called blackthorn for nothing! The bushes are armed with vicious spikes, so proceed carefully and consider wearing gloves to pick with. Personally I don’t, but as a result I give a blood sacrifice for my sloes every year. 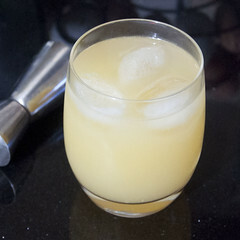 This gin is very simple, and is sweetened to my taste. You might find your palate runs to more or less sugar. I’ve also seen gin recipes with spice additions such as a cinnamon stick, vanilla pods, and so on – so go ahead and experiment! An empty 1l glass screw-top bottle. Kitchen scales, a measuring jug and, if available, a funnel. 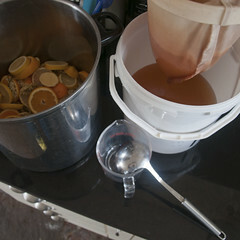 Transfer 600ml of the gin from the 1.5l bottle to the clean 1l bottle, leaving 900ml behind. Using the dry funnel, add 300g of sugar to the small bottle and 450g to the large one. 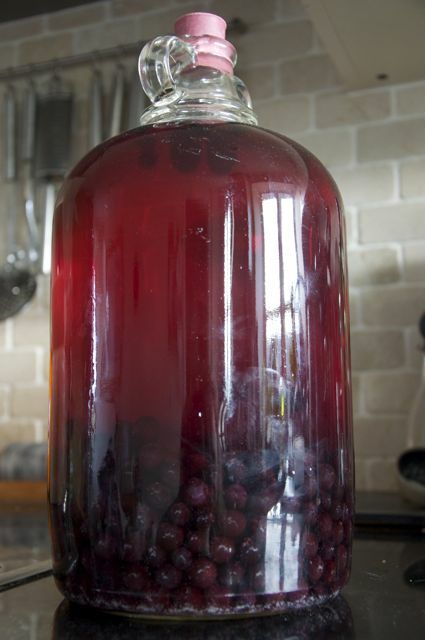 Fill up the remaining space in the bottles with the sloes. Put any extras back in the freezer. Give the bottles a good shake several times a day until all the sugar dissolves. 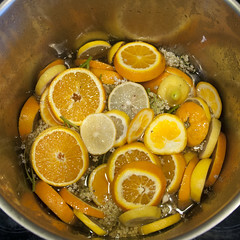 By this time it should have a similar appearance to the photo above, with colour starting to come into the gin. Then put it in a cool dark place and forget about it for at least two months. After that, strain the gin from the sloes and store in clean bottles. In the past I’ve bought some pretty-looking 250ml bottles and used these for Christmas presents, which seem to be popular! Add a couple of the excess sloes you put in the deep freeze to each bottle for that extra decorative touch. Making bacon is really easy. It will take a few minutes a day for about a week, and cost very little (certainly less than buying really good dry-cured bacon). The bacon you will make will sizzle and crisp with that gorgeous sweet smell of real bacon, and will render only bacon fat into the pan. The rind, if you decide to leave it on, will be crisp and crunchy. With experimentation, you will be able to control the saltiness, sweetness, smokiness, and any other seasoning flavours you might desire. That, in a nutshell, is why you should make your own bacon. So, assuming you’re convinced, what do you need? Second, some meat. The easiest cut to start with is a piece of pork belly. Try to find a nice fresh piece about 500g in weight. Very cheap pork belly can be bought from supermarkets, usually in the ‘bargain cuts’ section for about £2 – 3. Better still, get a nice piece of outdoor reared belly pork from a good butchers, which round here will set you back £4 – 5 for around half a kilo. The fat should be scored (it probably will be anyway). Thirdly assemble the rest of your equipment, which you probably already have. You want some soft dark brown sugar (or indeed any sugar, but the less refined it is, the better the resulting flavour). Dig out your kitchen scales. You need to find a non-metallic container (oven dish, or tupperware) large enough to comfortably hold the piece of belly pork with plenty of room around for air circulation. You will also require some cling film and some greaseproof paper / baking parchment. Last of this difficult to procure list, a small sealable tupperware box or ziplock bag. All set? Right, let’s get going. Weigh out 40g of the supracure and 10g of the sugar into your sealable box or ziplock bag (we’re aiming for about 10% of the weight of the piece of meat in total cure, so if your piece of belly is bigger or smaller, adjust your quantities accordingly). Mix well. Also carefully re-seal your bag of supracure, as you don’t want moisture to get in. Dry the piece of belly pork with kitchen paper and put into the non-metallic dish. Rub all the surfaces generously with the cure mix, we’re looking for a 5 day cure so you’re aiming to use about 20% of the total mixture, however I’ve found I use a bit more on the first day and less later on. You want a bit more cure on the meat surfaces and less on the fat. Cover loosely with cling film and put it in the fridge. That’s it for today. Every day for the next four days, take it out of the fridge, pour away the liquid which will be appearing in the dish, re-salt and leave the opposite side up to the day before. Re-cover and return to the fridge. Over this period, the piece of belly will appear to shrink, the meat will darken in colour, the fat will remain white, and the texture will become firmer. On the sixth day, take your bacon (for bacon it now is) out of the dish, rinse carefully under running water, pat dry with kitchen paper, wrap loosely in the baking parchment and return to the fridge on an open shelf for a couple of days. Try to make sure the air can circulate freely around the bacon, as this will help it continue to dry out. 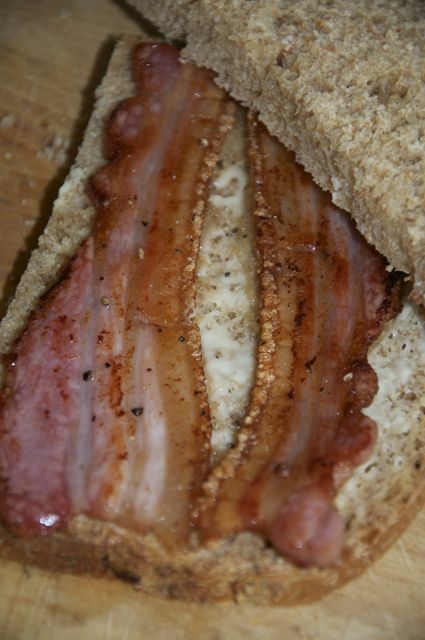 You will notice a slightly tacky shiny surface develop on the bacon, this is normal and desirable. Over the 48 hours, the cure will continue to distribute more evenly within the piece of bacon. If you were going to smoke the bacon, now would be the time to do it. Now enjoy! Slice as thinly as possible (I recommend keeping the the ‘edge’ slice for cutting into lardons and cooking with, as it can be uneven in shape and will be saltier than the rest of the piece) with a very sharp knife, put a couple of slices into a hot frying pan, and wait for the sizzle! You can cut the rind off before or after cooking, but I wouldn’t! The fact the fat was scored on the piece will stop the rind deforming the bacon as it cooks. The bacon will keep better if you slice it as you need it, you should be able to keep the block of bacon in the fridge for a good 2 – 3 weeks, though I doubt it will take that long to eat it! If you need to store it longer, you can freeze it, either the whole block, or perhaps slice it all, interlace the slices with paper or film, and then you can defrost a slice at a time as you need it. The whole project takes about five minutes on day 1, 30 seconds each on days 2 – 5 and then perhaps two minutes on day 6.